60 COLOURS! ✔ FREE 1st CLASS P&P! ✔ SAME DAY DISPATCH! !!! New 2019 Colours Available Now Long Expiry Date !!! Essie Nail Polish/Lacquer 13.5ml/15ml - SUPER SALE!!! Mavala Nail Polish - 34 Beautiful Mavala Colours to choose from here! KEY FEATURES 14 day high-gloss wear. 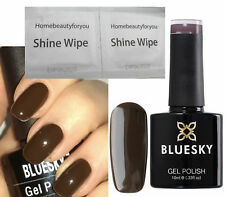 On like a polish, wears like gel No nick, chips or smudges Dry under UV or LED lamp Fully tested and EU approved Mirror shine finish DIRECTIONS Prep and push back cuticles Apply Bluesky base coat and cure under UV/LED lamp for 2 minutes/30 seconds Apply colour in a thin application. Cure under UV/LED lamp for 2 minutes/30 seconds Apply a second coat and cure under UV/LED lamp for 2 minutes/30 seconds Apply Bluesky Top coat and cure under UV/LED lamp for 2 minutes/30 seconds Wipe off sticky tacky layer CONTACT DETAILS The best method to contact us is via eBay,Click ask seller a question or "contact seller" option TERMS AND CONDITIONS Your shipping address must match your PayPal address. Please note once you completely the . SAFFRON NAIL POLISH. Saffron Collection London. Made in EU.